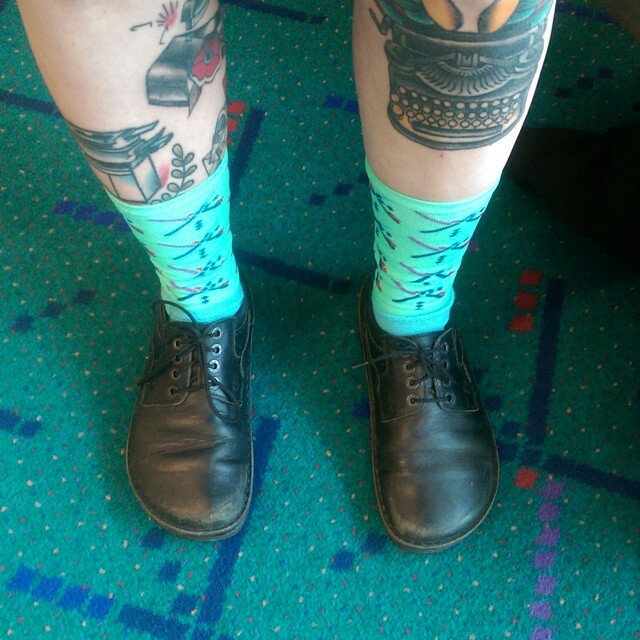 Did you know the Portland airport carpet is a thing? It’s totally a thing. It’s a thing on Instagram so it must be a thing! I may not have been born in Oregon but my mother swears that the raised me to be an Oregon girl and I’ve been coming to the Portland airport since I was an infant to visit family right up to my 21st birthday trip (it was all about the craft beer!) I moved here in 1999 when I was 22. The Portland airport carpet has been a staple since 1987 when I was 10 years old. I was an angsty teen dressed in a Vision Street Wear or oversized Cure shirt and attempting to drown out the word with my headphones while being dragged away from a Utah summer with friends to hang out at my grandparents or cousin’s houses. 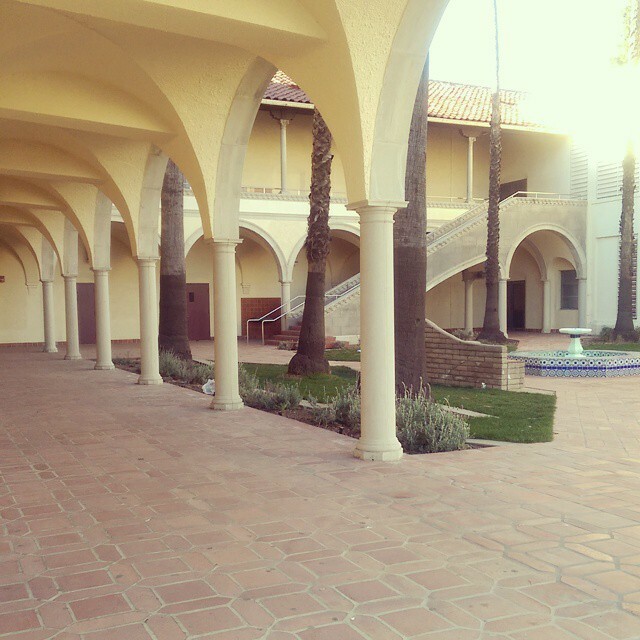 I walked on that ugly obnoxiously bright carpet saturated in late 80s jewel tones. I think it was one of the first airports that had carpet and they didn’t allow chewing gum so that the carpet wouldn’t get ruined. That always reminded me of the Shonen Knife songs about no chewing gum in Singapore. 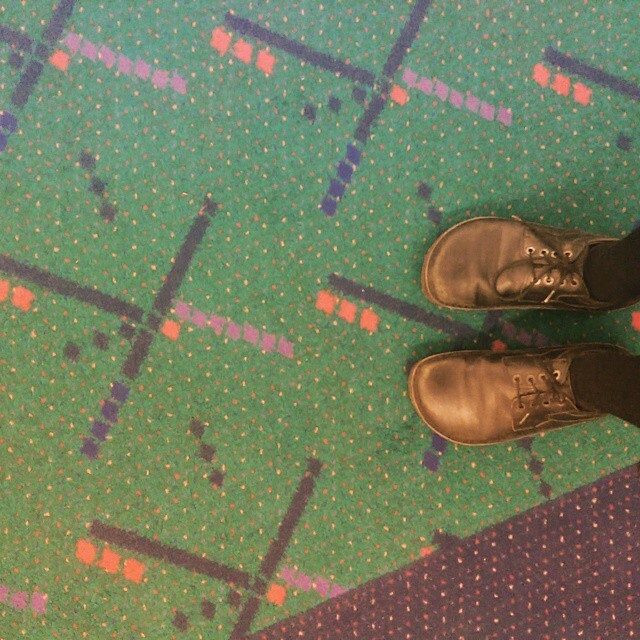 Anyway, since they have decided to update the ugly carpet people have been taking photos of their feet at the airport and tagging it on instagram with #pdxcarlet Let’s make no mistakes, the carpet is old and gross but I can’t help join in the celebration of my favorite city and my favorite airport, and my home. So, here’s my feet on the way to L.A.
L.A. Where it was going to be 85+ degrees and I left Portland in a heavy coat and leggings under everything where it was probably in the high 40s. I got in pretty early in the morning and my lovely host, Amber, was working but my buddy Jonas was in town so I went to go hang out with him. 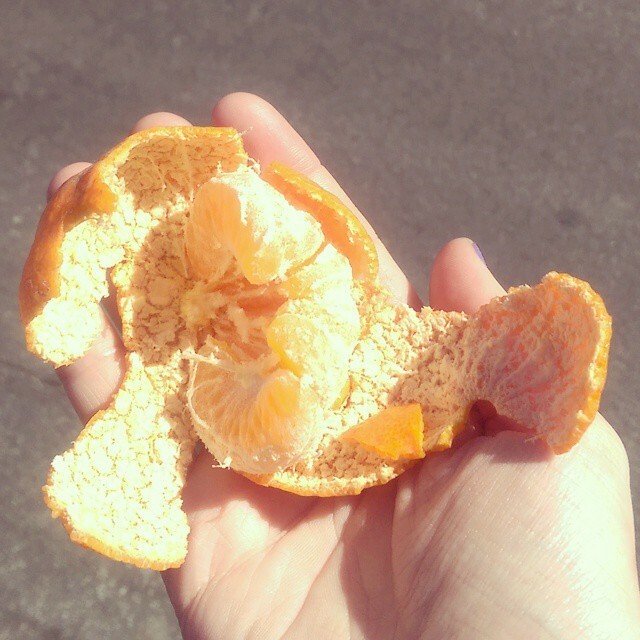 The house he was staying at had a tangerine tree in the front yard. I utilized his tall-ness to grab one for my shortness. 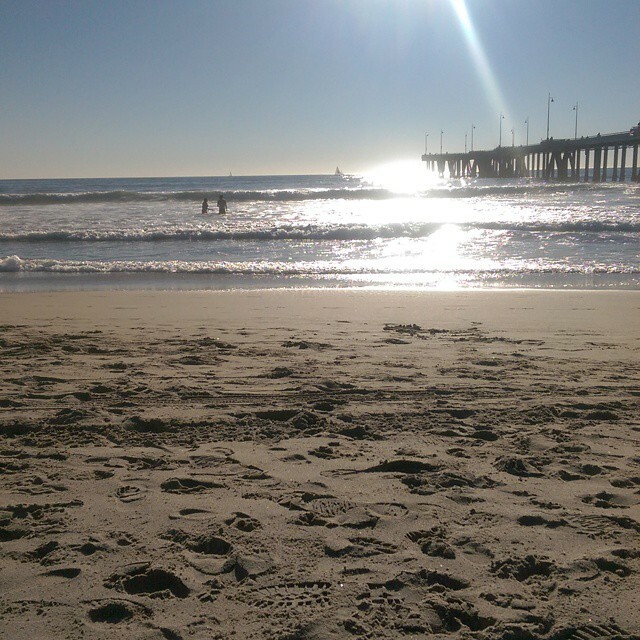 It was perfect. I don’t know why I’m always mesmerized by the fact that you can just grow citrus and avocados in California, but I am. What’s a trip to the California coast without a photo of the sun setting into the ocean? 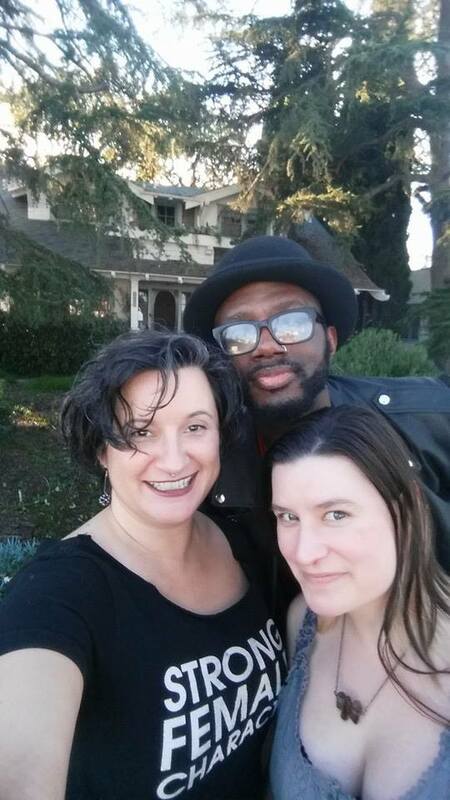 On Saturday Jonas, Amber and I had planned a DIY tour of Buffy the Vampire Slayer filming locations! 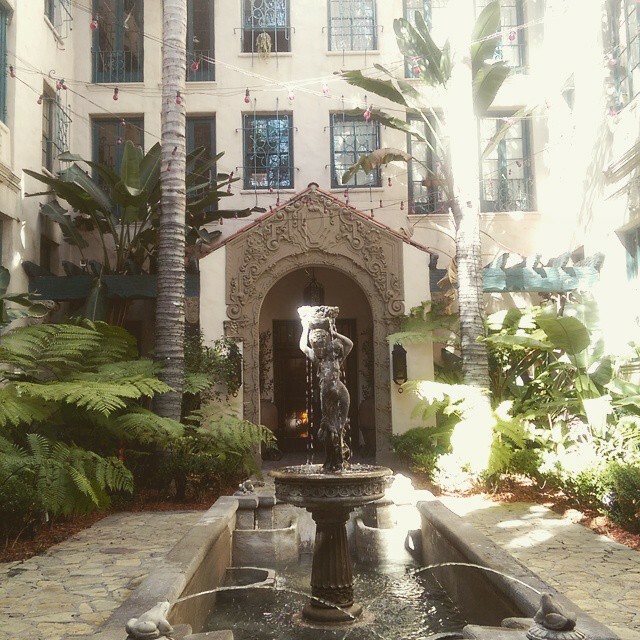 The next stop was an apartment building that served as the Hyperion Hotel in Angel. 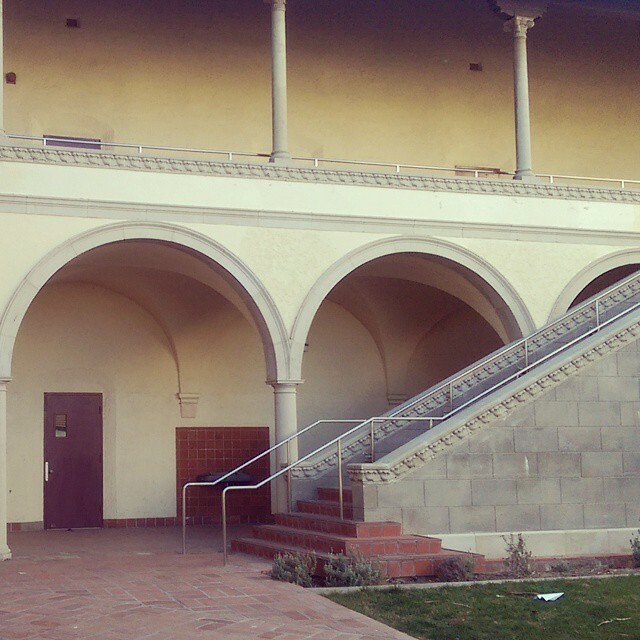 We could only get into the courtyard. Next up! 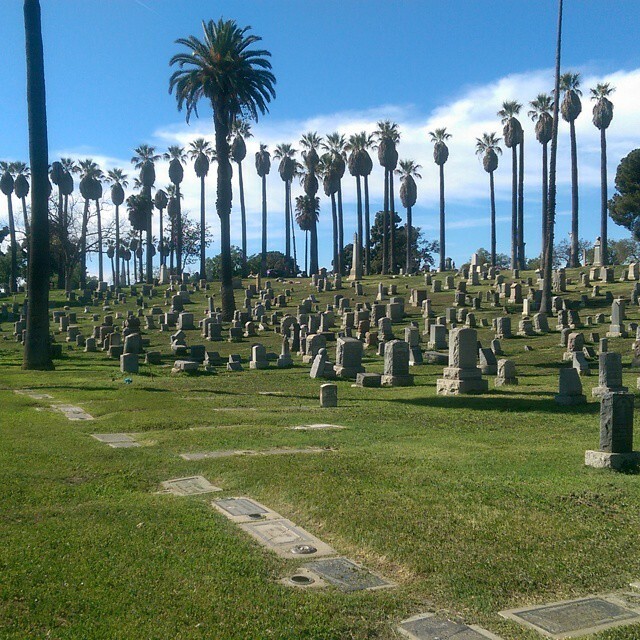 A cemetery that some of the scenes were filmed at. Most cemetery scenes were filmed on set, but this was a pretty cool cemetery. 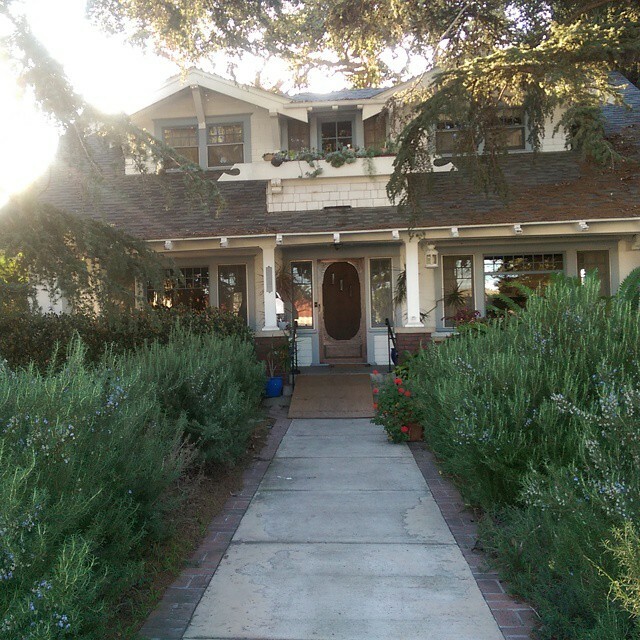 After that we headed to Torrance to Buffy’s house! 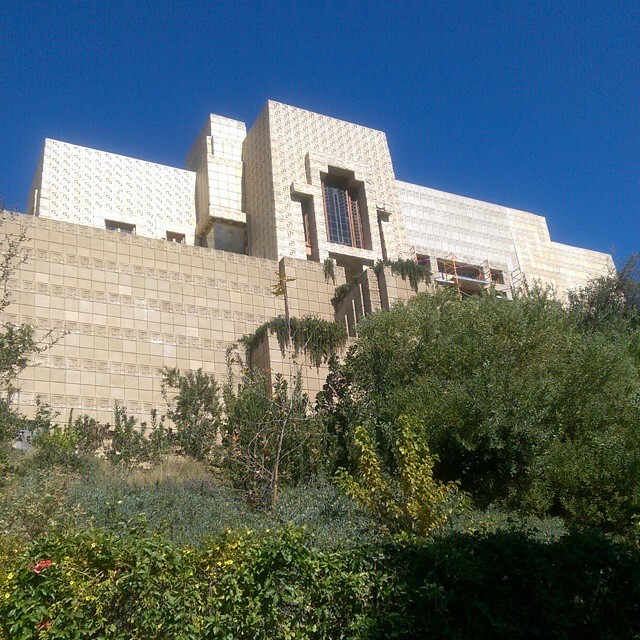 1630 Revello Drive is not actually on Revello drive. The yard had more foliage than expected. There were bushes of lavender lining the walk and we loitered around outside like Spike. And also took a selfie with the Summer’s residence. 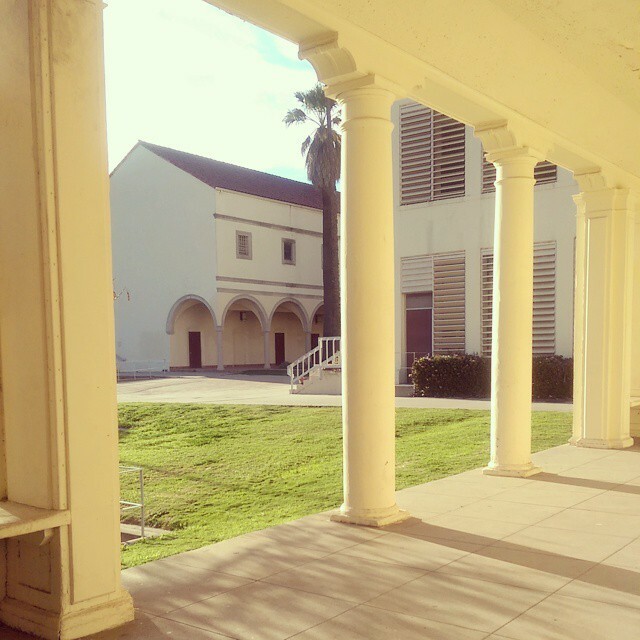 It was a very “California” high school with lots of separate buildings and court yards to wander around in, not contained at all. It was super fun! 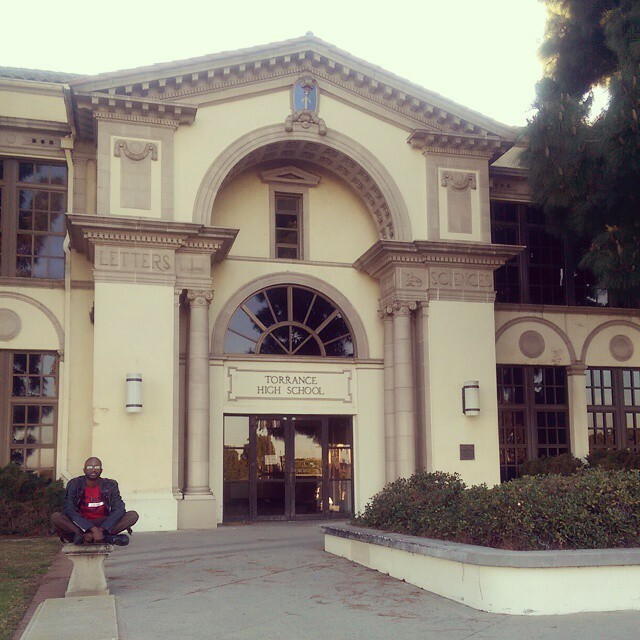 I suggest you make your own tour if you get a chance. 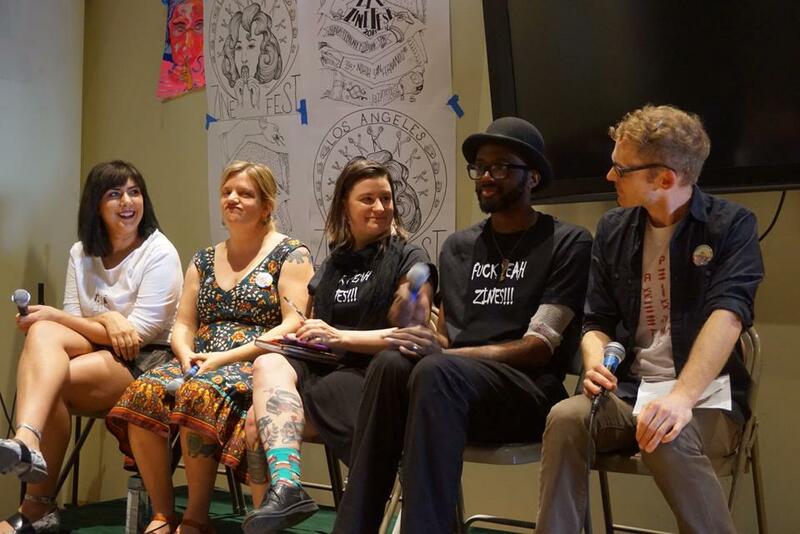 here’s me on a panel with some awesome zine friends talking about perzines and what and how you choose to tell personal stories. What’s a zine fest without some games of Mystery Sharpie Knuckle Tattoo games! 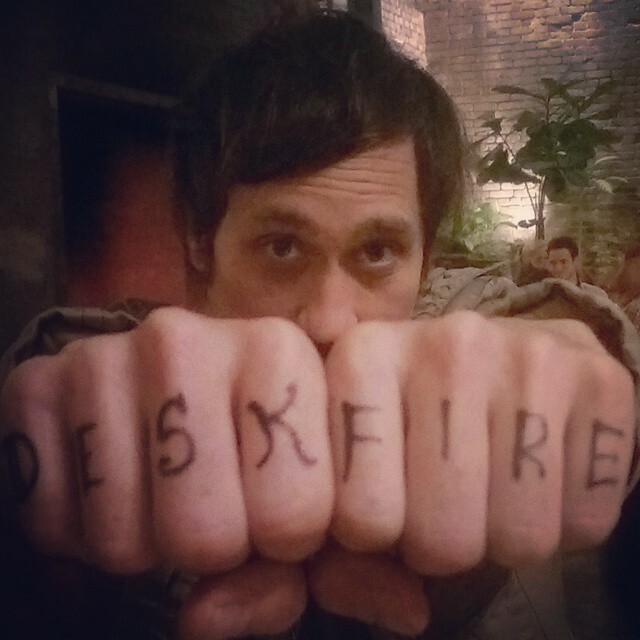 This one was my favorite with Adam Gnade from Pioneers Press. 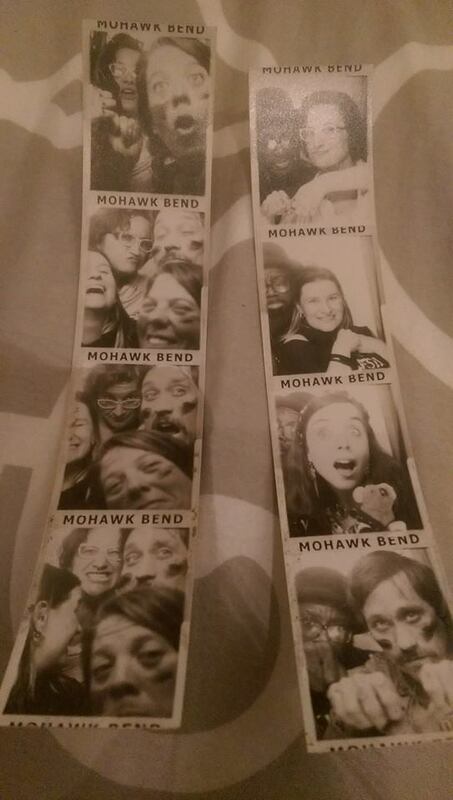 Photobooths with friends is another staples of zine fests! And then I headed back to Portland where the weather was unseasonably nice! I didn’t even have to wear the leggings I brought as part of my carry on! 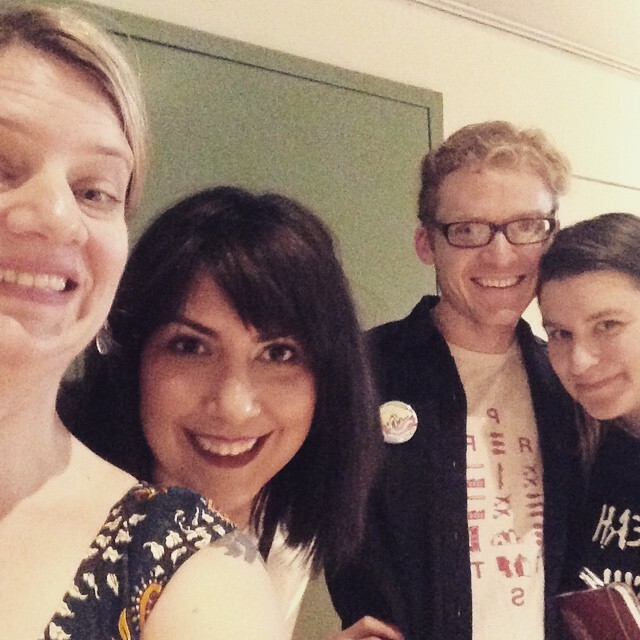 I just supported the Olympia Zine Fest’s Indiegogo campaign! You should do that too. You can get a table at a discount! Also, The Chicago Zine Fest will be in May this year and we just signed up! Tables went quickly but we made the cut! Alright! For the Activity of IZM Day 3 I ordered a zine from Doris Press. My favorite zines have always been by my friends, or people who became my friends through penpals and travels. So many connections as I dug through boxes stopping to think about the connections to each person. Some I haven’t seen in year, but the feeling was visceral. I could recall exactly how I felt when I retrieved a zine from my mail box of cracked the cover while sitting on the bus. I’m missing a lot of the “popular” zines. I lost my zine collection in my divorce, but I complained about it publicly enough so that a version of my zine collection was sent back to me. It was missing old issues of Cometbus, Doris, Burn Collector, etc. But that’s ok. I still had Lunchroom, Paul’s zine that I got from him at a show in 1997, and Maybrick’s Diary and all sorts of mid-90s zines from Salt lake City. Plus, I got back a lot of the zines from my personal penpals. Some of them I lost touch with like nicole from Voice of One from Hamilton, Ontario and Tim from Hello Nothing from Winter Springs, Florida who had the same birthday as me. I wonder where they are? I took this photo on my table this morning after we sat around reading zines and listening to records last night. I love zines and rereading my favorites reminds me why! So, I feel pretty confident in a lot of the zine skills I have. However, I did buy a table top photocopier that arrived last week. I’m finishing up a huge button order and I haven’t let myself play with my new toy yet. I hope to get that order wrapped up today so I can see what it’s got in the way of making some fun photocopier art! Ok, I really wanna try to keep up with the blog again and what better way than to also keep up with International Zine Month? Day 1: I posted in this thread on Wemakezines. 1. When I was a teenager growing up in Utah in the 90s zines showed me a different world outside the oppressive one I was living in and opened my eyes to new experiences and ways of living. 2. From that first moment of realizing “I can do this too!” Zines have given me an exhilarating sense of self expression on my own terms. 3. I could do something and be a part of a culture that wasn’t just forming bands and I didn’t need to find other people to work on a project. 4. Zines gave me a new name. True story! 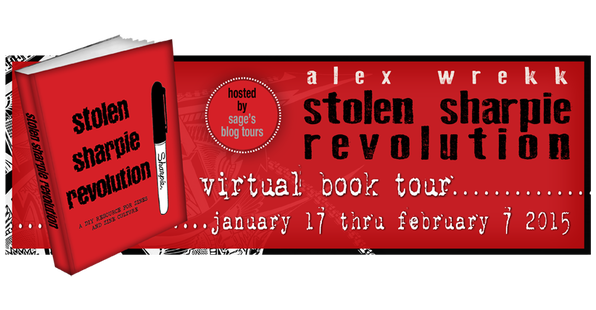 You didn’t really think my actual name was “Alex Wrekk” did you? 5. Zines fueled the love I already had for mail and postal goodness. When I was 19 my post box key was a prized possession that gave me access to a whole world. 6. Zines gave me something to do with my paper hoarding and office supply obsession. 7. Zines helped me get out of Utah. 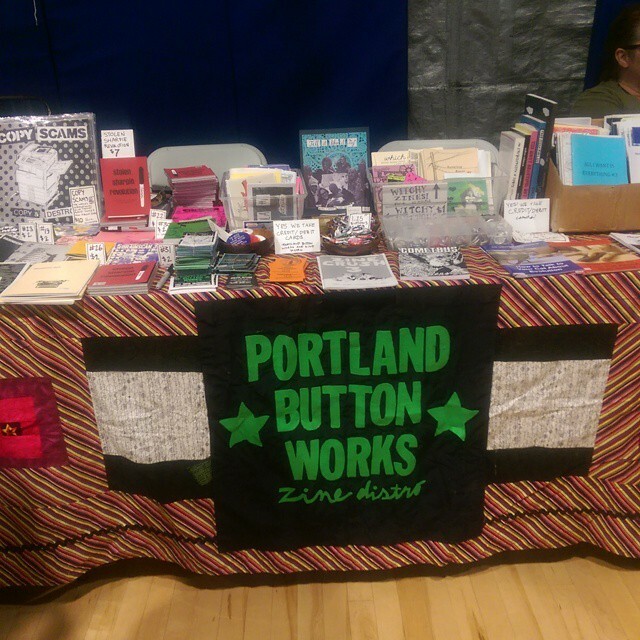 I moved to Portland in 1999 and most of the people I knew here knew me from zines. Zines automatically gave me friends in a new city. 8. Zines opened my eyes to new experiences from politics to the fascinating lives of people who were very different than me. 9. Zines give me more than just “tourism” as a reason to travel and they give me a place to stay when I get somewhere with the invaluable local eye view of a city. I have been to zines events in dozens of cities in 4 different countries sleeping on the floors of people that I only knew from paper. When I was 19 I wrote in a zine that I wanted to be able to know enough people through zines than I would always be able to find a place to stay across the country if I needed it. I think I’m pretty close to that. Conversely, I invite those people back to my city to share when they are in my town, The Portland Zine Symposium is a great reason to get people to visit me! 10. Zines have given me some of my very best friends. I even met my partner, Paul, through zines in a way when we traded zines at a show in 1997. I feel like these connections through zines are some of the strongest and most lasting over the years. It’s good to see my friends grow up and grow more into themselves. Play along at home with Events and 31 Activities for 31 Days of International Zine Month! 1 – Sign up or sign in to WeMakeZines.ning.com and write about IZM and what you plans are to celebrate zines this month! Feel free to write about it on your personal site as well! 2 – Make a Top 10 list of reasons why your love zines, post them online if you would like. 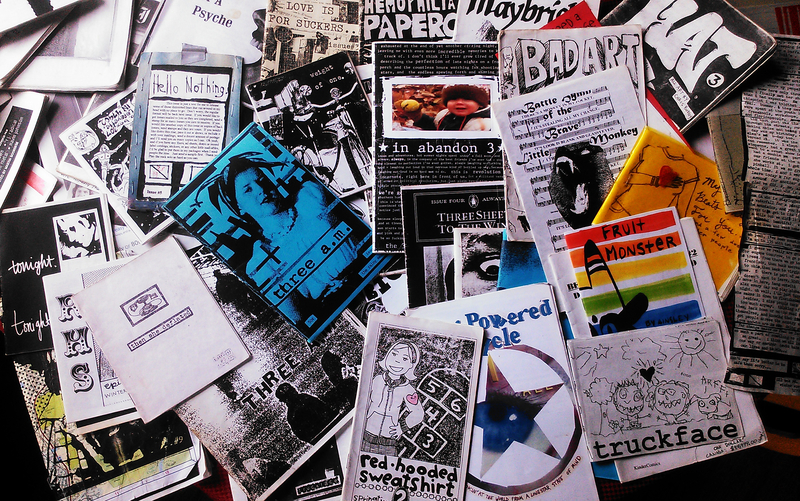 4 – Reread your favorite zines and remind yourself why you love them so much. 7 – Make or decorate some envelopes or postcards to get ready for the week. 8- Make a little flyer for your zine to send out with orders and see if other people will trade for stacks of them so you can all promote each other. 9 – Write a letter to a zine maker that you don’t know. 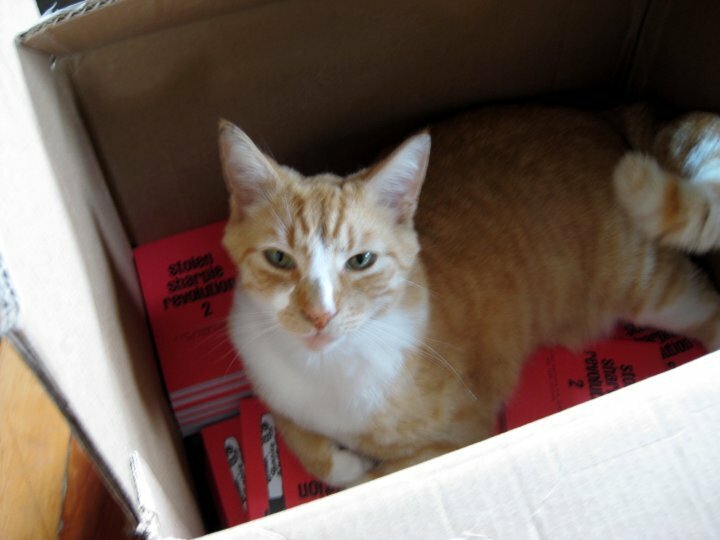 10 – Send a care package to a zine creator that you do know. 12 – Send your zine out to be reviewed. 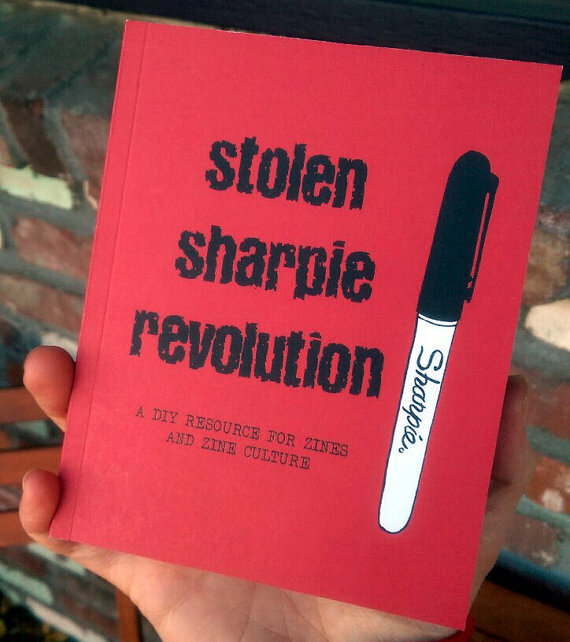 15 – Leave a zine in public for someone else to find. 15 – Promote a zine that you really like that is not your own. 16 – Send your zine to a distro for distro consideration. 17 – Review a zine online or write a review of a zine to add to your zine. 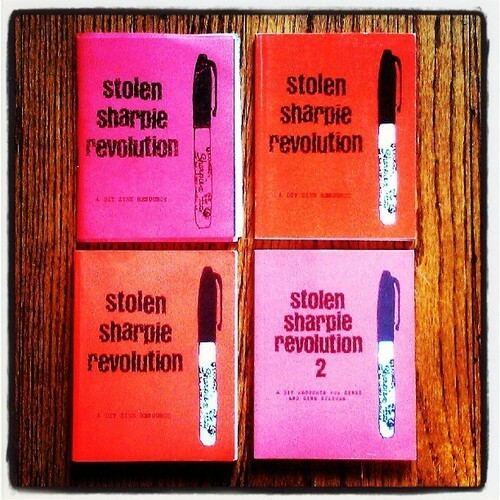 18 – Order from a zine distro that you have never ordered from before. 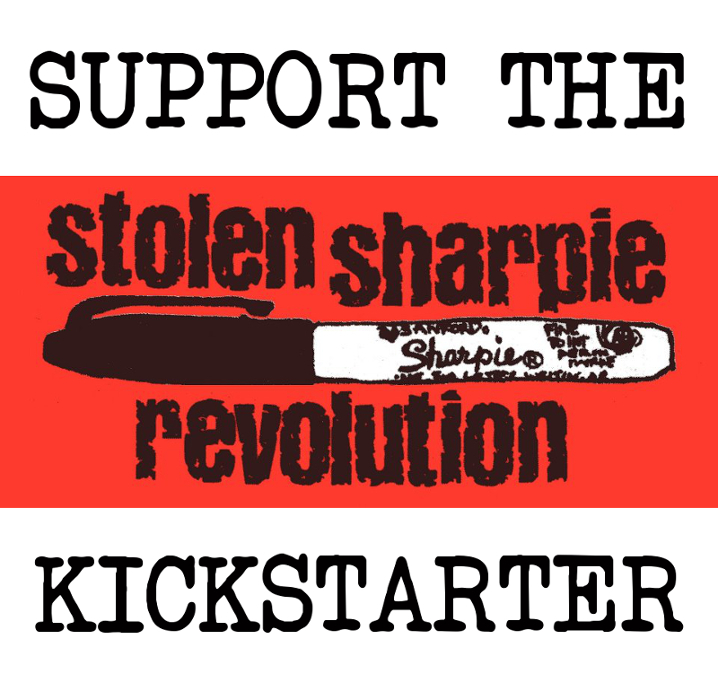 19 – Zine Shop appreciation day! Stop by a shop that sells zines and buy some zines or consign your zines. 20 – Free Zine Day! Give your zine away to someone! 22 – Send your zine to a zine library. 24 – Organize your zine collection. 25 – Teach a friend or family member about zines. 26- Submit something to a compilation zine. 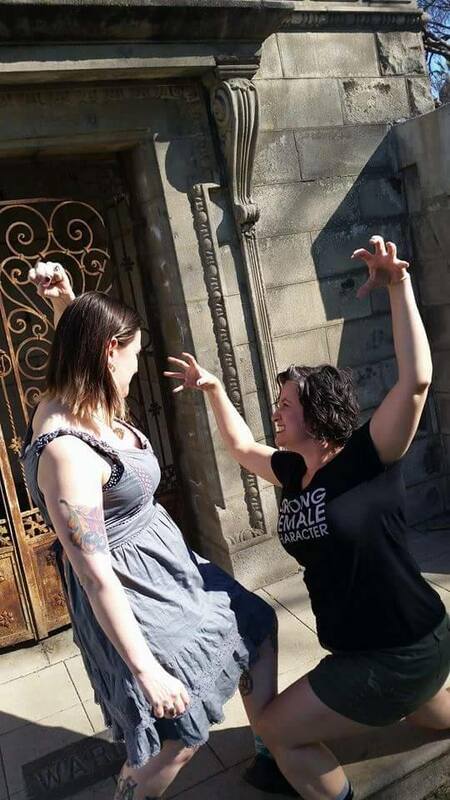 27 – Organize a zine event! 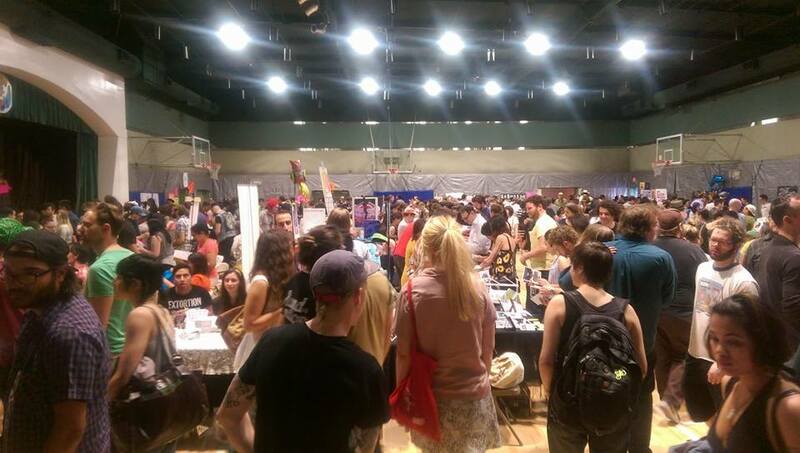 A zine reading or a zine fair or fest or even just for friends to get together and work on their zines. 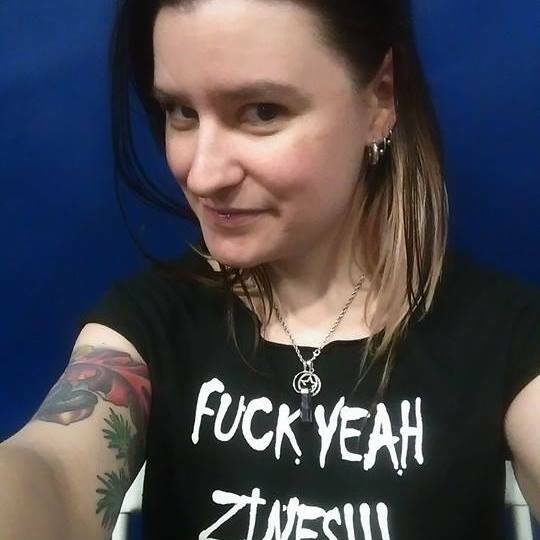 29- Post a photo online of you with your zine or your zine collection. 30 – Read some zines! Lay in bed and read zines all day if you can! 31 – Log into WeMakeZine and write about your experience or write about it on your own blog.